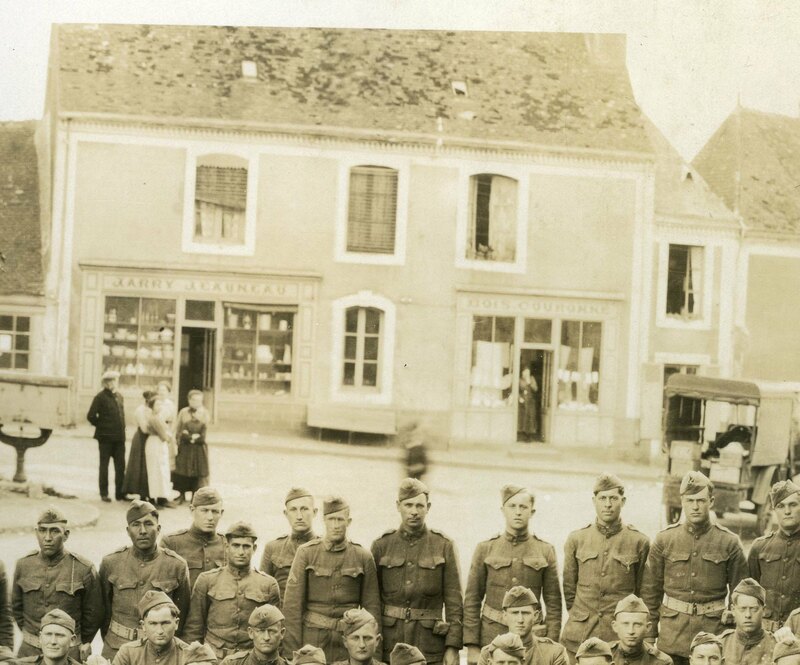 WWI Panoramic Photo Yardlong – 36th Division, 131st Machine Gun Battalion in French Street – Check the Detail! The large format of WWI panoramic photos is not an easy scan, but after scanning this yardlong photo in seven sections, I was able to seamlessly splice the photo together using Photoshop. The results are an eye pleasing display of WWI doughboys sitting in a French street. One could spent hours looking at each battle wizened face, or the citizens and scenery in the background. 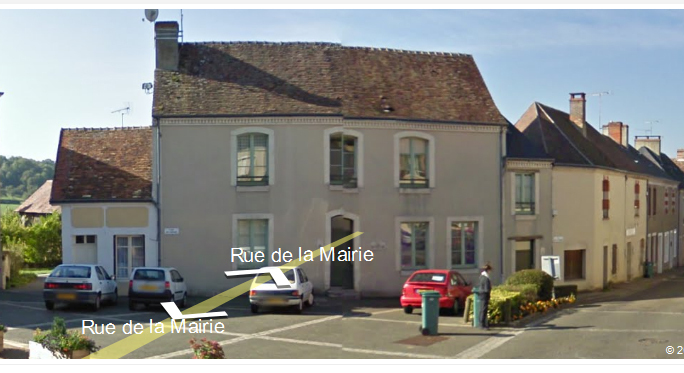 Using the magical power of GoogleEarth, I was able to track down the exact street corner in this photo. Not much has changed in 100 years! ← WWI 28th Division Mascot Dog Photo – Jack Russell Terrier Wearing a Vest and OS Chevrons! My Grandfather was in the 132nd Machine Gun Battalion in the 36th Division but was used by the 42nd Rainbow Division. He was hit several times with a 50 caliber Maxim Machine Gun and stranded in No Mans Land in a shell hole for 5 days without food or water. Any chance that you have a picture of that Battalion? His name was Bill Morrison and lived in Fort Worth Texas. He was first in the 1st Texas Field Artillery as a Voluteer in the National Guard for Boarder Patrol on the Mexican Border around 1916. In 1917 they were transitioned into the 132nd Artillery at Camp Bowie by General Pershing’s orders. So any photos of the 132nd battalion would be appreciated. If I saw his face as he was about 16 or 17 then, I would recognize him quite easily. He would look like a very young Cole Younger because Cole was his Uncle. Cole’s much younger sister Henrietta Younger was bill’s Mother. Like I said any photos or info would be greatly appreciated. I have some newly acquired 132nd Machine Gun Battalion photos! Please contact me at thegemguy@hotmail.com so I may somehow see the photos and hopefully use them. Somehow by accident I got to this site again. Do you know of anybody that may have the roster list to these battalions? This would be a great gift to my Uncle and Aunt to see their father’s photo in his latter teens. I would be interested in seeing the 132nd machine gun battalion photos. My grandfather served in the 132nd MGB, 36th Texas Div. How can we see these photos? Also, I have several as well of personnel of 132nd – how do I get them to you? Could I please get a copy of that picture of the 132nd machine gun bn? Mr. Combs, I’m looking for information on my Great Uncle Hedgpeth, who was also in the 132nd, killed in action (currently working to find details from an old box full of letters I found at my late grandmother’s house) from the panhandle of Texas. Would be greatly appreciated if you could send me an e-mail, robertsteagall@me.com, and maybe between the both of us we can help each other find photo’s and information on our ancestors. Thank you. My name is Jerry Buzan, and my great uncle, Oliver Windell Buzan, was also in the 132nd. He was killed 9 Oct. 1918. Any info on the 132nd or my uncle would be greatly appreciated. Like Mr Combs, my Grandfather – OM Henson – was assigned to the 132nd MG BN in France. Any photos of that unit would be most interesting. My contact is dlhenson.twar@gmail.com. My grandfather served as a motorcycle courier (with machinegun mounted on a sidecar) with Company B, 131st Machine Gun Battalion, 36th Infantry Division in France (WWI). Any originals or reprints of photos available for sale? Wow! What types of photos are you looking for? I have two WW I panoramas at http://www.jewelant.wordpress.com One is the complete 316th, and another of Bat. D. Come take a look. I scanned mine in sections, and the merge has some edges to it. Really like your blog. Thanks! Great stuff! I also scan mine in sections and do a photo merge. Nice stuff – great site! I have a panorama pix of 132nd MG Battallion. My grandfather, William Purnell, was in this unit. I also have several photo post cards of him in training. Any other photos available? Could you send me a scan of your panorama pix of the 132nd? Or, I will pay for a duplicate. My Grandfather was a machine gunner with the 132nd. I am happy to do this. I am currently overseas and will not have access to the picture until August. I also have several other scanned ones. If you could send me your email I am happy to share. My great grandfather was in the 132nd MG Battallion. I would be very interested in getting copies of his unit. I know so little about him, except he was a cowboy from Oklahoma. My grandfather is in this picture. His name was Seth W. Johnson (1896 – 1979) and he was from Doxey (near Elk City) , Oklahoma. He is ninth from the left, third row from the bottom. Hi, I’m a primary school teatcher who lived in that village. I’m preparing my classes and I discovered that photo. Someone could tell me why américan soldier were in France during the first world war? I apologised for my english, my children are better thant me but theyaren’t at home anymore, and nobody can help me writing better. During the First World War, Germany invaded France and several other countries. In response, Britain, the US, and several other countries sent soldiers to France to help the French Army repel the German occupation. The US forces were known as the American Expeditionary Force (AEF) and were led by General “Blackjack” Pershing of the US Army. The 36th Infantry Division’s 131st Machine Gun Battalion, in the photograph, was one of many US Army units assigned to the AEF and deployed to France in the latter months of the war. Jim Moore, jpmoore51@gmail.com, grandson of one of the soldiers in the photo. My grandfather is in this photo. I’m wondering who posted this here and if they would be willing to sell a copy or a hi-res version. I joined the Army 25 years ago, he loved serving and so do I…would love to have this framed hanging on my office wall. (Co. B 133 MGBN 36 Div). His name is William A. Schupp and was born in Lucinda, PA. He passed away when my grandfather was in high school and he has no photos of his father. It would mean the world to my grandfather and me if you had any photos of him (or his division/battalion) that you could share with me. Thank you portraitsofwar! May I use this photo, with credit to you, in a documentary I’m producing on WWI General John Pershing? Please do! What is your documentary about? I’m actually friends with some of the direct ancestors of Pershing. They may be interested. My great uncle was in the 132nd machine gun battalion. I would love to see a picture of that group.